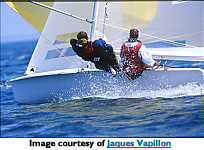 The 505 class sailing dinghy is an international design two person, fast, responsive, quick accelerating racing craft. With a trapeze, spinnaker and a large sail plan, the boat offers good competitive tactical racing and is very exciting to sail. 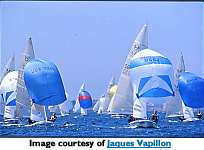 The boat is sailed in over 17 countries throughout the world with world championships being contested each year. Many well know yachtsmen have sailed in the class including Paul Elvstrom, Sir James Hardy, John Cuneo, Ian Brown, Iain Murray, David Porter, Stephen McConaghy, Chris & Darren Nicholson and the Kyrwood Brothers. At of October 2001 more than 8,770 boats have been registered throughout the world. To learn more about the international association and the various national fleets visit the international sites page. The Australian fleets are located in Sydney, Lake Macquarie, Brisbane, Townsville, Bowen,Cairns, Adelaide and Perth. 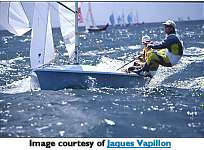 The world championships are sailed every 12 months and Australia has won a number of themin the last 10 years. The Australian Championships are normally conducted in late December - early Januaryeach year. Copyright © by Swiss 5o5 Association All Right Reserved.